The T32 is an American tier 8 heavy tank. An experimental World War II American heavy tank. Developed on the basis of the M26 Pershing and T29 tanks. Prototypes were built in 1946; however, the T32 never entered mass production. 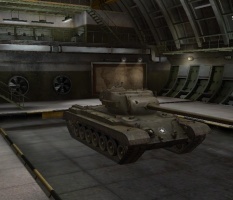 The T32 is, compared to the earlier T29, a more balanced tank. 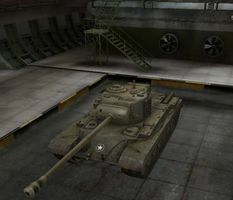 Combining the still heavily-armored turret with more adequate hull armor, decent mobility, and a sleeker body, it is a tank that better controls what the enemy targets on it. Compared to other tanks of its tier, the T32's main weakness is the 105mm T5E1. Against the tier 10 tanks which the T32 faces (and the T29 avoided) as well as some tier 8 and 9 tanks, it lacks high penetrating power and thus struggles in frontal engagements. 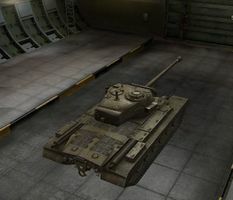 The T32 excels when paired with or against medium and light tanks as either a hunter or a supporter for flanking and pushes, or against heavy tanks as a defensive bunker in primary lanes to slow pushes. The T32 leads to the M103. Has one of the strongest turrets in the game; nearly impossible to pen from the front and even the side is tough. Good gun depression and handling. Improved hull armor thickness and angling over the T29 allows for a few lucky bounces if angled properly. Great view range for a heavy tank, same as the Pershing. Decent side-scraping abilities due to large tracks. 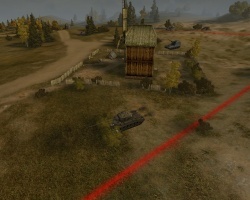 Hull armor is still penetrated outside of top tier, despite being slightly thicker and better angled than the T29. Bottom of the gun mantlet may ricochet shots into hull roof (shot trap), occasionally compromises turret armor. Worst gun selection in tier, penetration, accuracy, alpha damage and RoF are all below average. Struggles to reach the already mediocre top speed due to bad ground resistance. As stock, you can't expect much out of a T32. 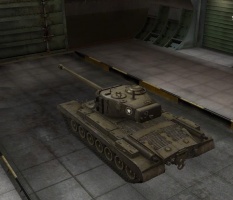 It has the health of a tier 7 as stock, weak turret armor and an inadequate gun. The 90mm is insufficient at tier 8 and the 105mm cannot be mounted with the stock suspension. Therefore, it is highly recommended to get Enhanced Torsion Bars 5+ t Class. 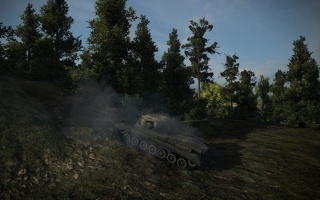 This will allow you to mount the 105mm but costs 500,000 credits and hurts the economy. After you upgrade the suspension, you may remove it if you wish. This tank is best played in one of two ways: as an aggressive brawler (against mediums or lone heavies) or as a support tank depending on the enemy you are fighting. One on one, you want to usually get up close and abuse terrain or poor opponent gun depression to hit enemy weakspots while moving diagonally in small amounts between shots to make it hard for them to hit your commanders hatch. However, doing this is ill advised if there is another enemy that can easily flank you or is vastly more maneuverable (unless you can corner them in a area that limits their mobility like an alleyway). You may also play as support with this tank. Let your team take the hits and give them support. If necessary, your health is sufficient to take a few hits for your team so a teammate can live to see another shot. Additionally, the hull armor is sufficient against low-powered cannon and the turret armor is extremely strong. Avoid any opportunity to give your opponents a shot at your hull except for trackwheel baiting shots or sidescraping, and you will do well. The main selling point of the T32 is its impeccable turret armor and good gun depression. This means that the vehicle will have excellent armor which is usable while retaining good mobility. Therefore, a hull-down position is the strongest position for this vehicle. Great gun depression and an invincible turret front means that it can easily remain virtually immune to shells coming from the front. Beware not to expose the bottom part of the mantlet though, as shots below it will easily ricochet into the hull and penetrate virtually every time (shot trap). Coupled with the fact that assuming a hull-down position over a ridge hides your weakpoints, you can easily provide a defensive block which is very challenging to dislodge. Another viable tactic, and what many T32 drivers like to do, is to face hug. By doing this, you increase the chance that they will only be able to shoot at the front of your turret or get extremely angled shots at your upper plate. This tactic is especially effective against Soviet or Chinese tanks, which have very bad gun depression and is often forced to shoot at the small and often moving cupola. Face-hugging also allows you to hit their weakpoints, something important given the relatively low-penetration cannon on the vehicle. A great chassis only balanced by a mediocre gun, it is a very versatile vehicle. There are very few vehicles that allows it to defend just as well as it can attack. On hills, no other tank at Tier 8 is more suitable; German tanks have large, flimsy lower glacis plates; Soviet or Chinese tanks have horrible gun depression and Japanese heavy tanks have thick armor and poor mobility that makes them better defenders than attackers. 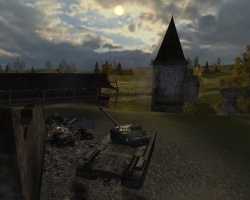 For its tier, only the M26 Pershing, T34, Caernarvon and Centurion I come close in terms of hull-down capability. The T5E1 105 mm gun, AV-1790-3 engine and SCR-528 radio carry over from the T29 and should be mounted right away. The stock suspension will not support the 105 mm gun. Either research the suspension immediately (free XP) or mount Enhanced Torsion Bars. If Enhanced Torsion Bars were used, research the suspension to free up the equipment slot. The successful employment of the heavily armored assault tank M4A3E2 in Europe during the Fall of 1944 emphasized the need for greater armor protection. On 7 December 1944, the Army Ground Forces recommended that the Ordnance Department develop a modification of the new Pershing tank with heavier armor, and the Army Services Forces directed that immediate action be taken to comply with this request. Two approaches were followed to solve the problem. The first produced essentially a standard Pershing with thicker armor and a lower final-drive gear ratio to maintain a reasonable level of mobility. This vehicle was designated as the heavy (later medium) tank T26E5. A longer range solution was to develop a new tank utilizing as many Pershing components as possible. On 8 February 1945, construction of four tank prototypes of such a vehicle was recommended and designated as the heavy tank T32. Formal approval for this project was recorded in March. 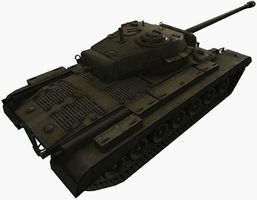 The design of the new tank proceeded on a high priority basis, and by 10 April 1945, a mock-up was almost complete and approximately 80 percent of the drawings for the first two prototypes had been released. A power package consisting of the Ford GAC V-12 engine and the cross-drive transmission similar to that planned for the heavy tank T29 was incorporated into the design. As many Pershing components as possible were utilized, but an extra road wheel was added to the torsion bar suspension, bringing the total on each side to seven. The Pershing's 23-inch wide T80E1 tracks were fitted with the five-inch extended end-connectors to further reduce the ground pressure. The high-velocity 90mm T15E2 gun with a single coaxial .30 caliber machine gun was specified for all four prototypes. This cannon used separated ammunition with a very long cartridge case, requiring a rearrangement of the interior stowage as compared to the Pershing. The 90mm T15E2 gun had a muzzle velocity of 3200 feet per second with the 24 pound AP T43 shot, and 3750 feet per second with the 16.7 pound HVAP T44 shot. The armor on the front hull was specified as five inches at 54 degrees from the vertical, and the turret varied in thickness from 11.75 inches in front to 6 inches in the rear. The front hull was cast for the first two prototypes and a .30 caliber machine gun was installed in a bow mount for the assistant driver. Both the driver and assistant driver had a single periscope fitted in the hatch cover over their seats. Prototypes 3 and 4 were assembled using rolled armor plate on the front hull and the bow machine gun was omitted. On the latter two vehicles, the driver's wide angle periscopes were mounted in the front armor and their hatch covers were pivoted rather than hinged, allowing them to be opened without interference from the traversing turret. 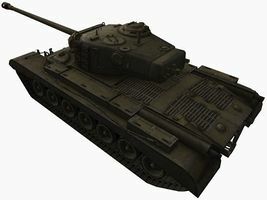 OCM 28680, on 9 August 1945, revised the military characteristics and recommended that prototypes 3 and 4 be designated as the heavy tank T32E1. Prototypes 1 and 2 were completed on 15 January and 19 April 1946, respectively, and both were shipped to Aberdeen Proving Ground. Prototypes 3 and 4 (T32E1) were completed on 14 May and 19 June 1946. Number 3 was shipped to Fort Knox and the fourth vehicle was retained at Detroit Arsenal for engineering studies. The T32 was the first tank with the cross-drive transmission to be tested at Aberdeen and Fort Knox and, as might be expected, a lot of problems were encountered. The early EX-120 version of the cross-drive had the usual teething troubles of an experimental design and required excessive maintenance to keep it going. However, it led directly to the development of the CD-850 series of cross-drive transmissions, which became the standard in American tanks. 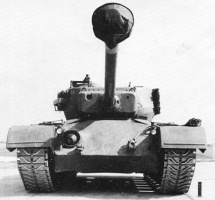 The T29, T30, T32, and T34 series of tanks were used to evaluate numerous experimental components after World War II. Although too late for the war for which they were designed, they provided invaluable service in developing these components for later tanks. Much of the work that made the early AV-1790 engine and the CD-850 transmission a reliable power package utilized these tanks. Later, they were used in the development of other power train components, such as the XT-1400 transmission, which was tested in the T30. The 90 mm gun was the T32's only main armament. The 105 mm gun configuration does not exist. This page was last modified on 7 April 2019, at 07:29. This page has been accessed 622,254 times.